The theme of this series involves communication: not the “structural” aspect, which we dealt with in previous articles (especially the series on nonverbal communication). Although, I will try to tie it all together. I like to think of this perspective as “functional” – especially the function we call persuasion. Clearly, one of the perpetual challenges in business is getting people to see (sometimes even accept) your point of view. This is true, for example, in negotiations and consensus based leadership. Business is all about persuasion: persuasion to follow our visions, persuasion to join the team, persuasion to perform. These examples of “internal” persuasion are complemented by “external persuasion” such as encouraging people to buy goods and services and/or be our partner. Hopefully, you can see how closely this all relates to areas of our Business Brain Model℠. Given the depth and breadth of our business, we think about this from all these perspectives (and more). The next three in this series are about what has worked at the Kirchner Group. And this may surprise you, but I will also share what has not worked at the Kirchner Group. 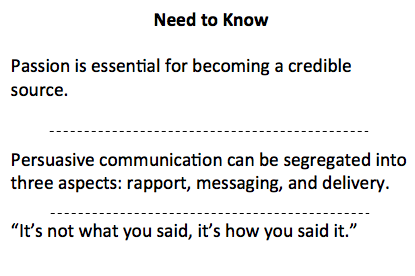 Moving forward, I have arbitrarily segregated communication (persuasion) into three aspects: rapport – messaging – delivery. First and foremost it is all about passion. I’m not talking about “Fifty Shades of Grey” book passion. I’m talking about the passion behind true commitment. 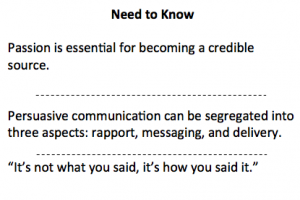 In other words: How do you become a credible (believable) source? How do you create a message that will resonate? How do you deliver in a way that will stick? So this is the next three posts, however, they are preceded by this review of a few basic communication principles. As a quick (but essential) aside, I would like to put forward a long held belief: First and foremost it is all about passion. I’m not talking about “Fifty Shades of Grey” book passion. I’m talking about the passion behind true commitment. If you are not committed to what you are doing, what you are saying, what you are believing; you will never convince anyone else – regardless of the skills you might have. Now – a few fundamental ideas (found in previous posts) that provide relevant background for the next few posts. In communication, as with most neurological based talents – skill varies (but passion is the great equalizer!). Only 7 percent of your communication occurs via words. We almost always believe the predominant nonverbal message over the verbal one. Posture conveys confidence and status as well as receptivity. If you help your face smile, you feel better. And it works on the person you are building a relationship with. You must be careful interpreting or sending nonverbal signals in other cultures. Getting on the same emotional wavelength is half the battle. What better quote than that to let you know there are three more posts to follow this one. Consider yourself about to be whacked with the keys to persuasion: emotional rapport; sincere messaging and dynamic delivery – three methods that seem subtle, yet are pile drivers that will help you embed meaningful messages into your counterparts.